A high-ranking Ukrainian military intelligence official has been killed by a car bomb in Kiev in what authorities are calling an act of terrorism. An explosive device destroyed the Mercedes being driven by Col Maksim Shapoval at 8.15am local time, police said. The car’s bonnet was blown open and its roof and driver side door almost completely destroyed, video footage from the scene showed. “The picture of the crime looks like it was a planned act of terrorism,” interior ministry spokesman Artem Shevchenko told local media. The military prosecutor said his office would lead an investigation. Police said a female passerby with shrapnel wounds to her legs received medical treatment after the explosion, as did an elderly man who suffered shrapnel wounds to his neck. According to the defence ministry, Shapoval was a colonel in military intelligence. The Ukrainian Pravda newspaper quoted law enforcement sources saying he had headed a special forces unit. Yury Butusov, editor of the Censor.net news website, said in a Facebook post that Shapoval’s unit had fought in eastern Ukraine, where a conflict with Russia-backed separatists that broke out in 2014 has killed more than 10,000 people. He claimed Russian intelligence could have killed Shapoval. Shapoval’s death comes almost a year after prominent journalist Pavel Sheremet was killed by a similar explosion in Kiev as he drove to work. A documentary film released last month revealed evidence suggesting that Ukraine’s spy agency may have witnessed the planting of the car bomb that killed Sheremet. No one has been brought to justice in the murder case. A number of other public figures have also been assassinated in and around Kiev in recent years. Denis Voronenkov, a former Russian MP who fled to Ukraine, was shot dead in central Kiev in March. Pro-Russian journalist Oles Buzina was shot in a drive-by in 2015, and lawyer Yuri Grabovsky, who had represented a Russian soldier captured in Ukraine, was found dead with a gunshot wound in 2016. A senior Ukrainian military intelligence officer has been killed in a car bomb attack in the capital of Kiev, the authorities said on Tuesday. According to the country’s defense ministry, the man was identified as Col. Maxim Shapoval of the Chief Directorate of Ukrainian military intelligence. 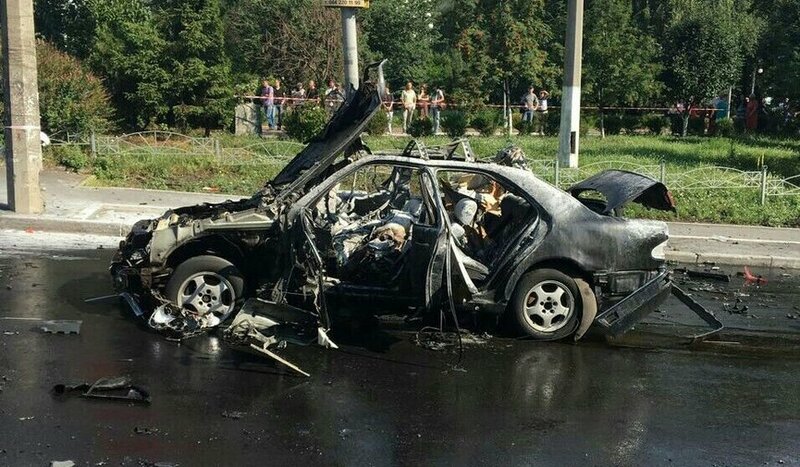 Shapoval’s car blew up in Kiev on Tuesday morning. Some Ukrainian media reported that Shapoval was chief of military intelligence’s special forces.